Customer Chat provides an additional channel for your customer to reach your Support team. Some of your customers may never use chat, but others may gravitate to this method if it is available. It is good to provide several different channels of communication and let your customers decide which one they prefer. 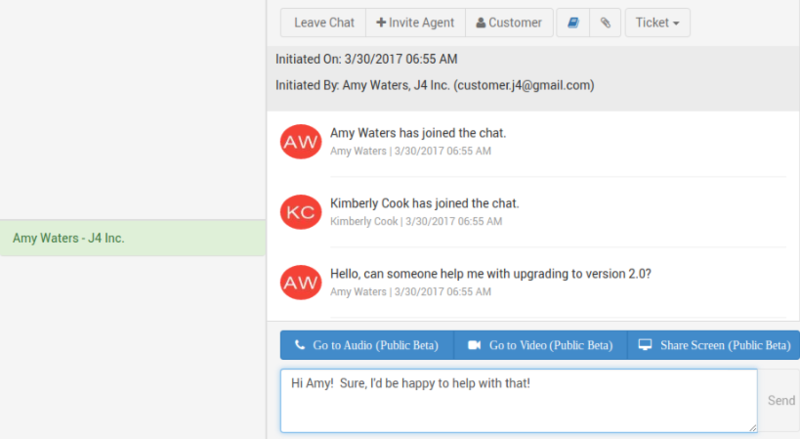 Enterprise Edition Only: TeamSupport’s Customer Chat has integrated screenshare and video share. This lets you effortlessly switch to a more interactive session should the need arise. Customer Chat is an optional feature: It can be easily disabled. Some of our new customers choose to leave chat off when they first start with TeamSupport, and then turn it on later once they are comfortable with the basics of TeamSupport. If you choose to disable it, you can re enable it at any time. Offline Chats: If a Customer initiates a chat when there are no Support agents available, a ticket will be automatically created for this chat with the title “Offline Chat”. Missed Chats: If a Customer initiates a chat and a Support agent does not answer the chat within 120 seconds, a ticket will be automatically created for this chat with the title “Missed Chat”. The Customer will receive a message to let them know that the chat was cancelled due to unavailable agents, but that a ticket was created. Multiple Chats: A user can work on multiple chats a one time. Customer Associations: If a customer is logged into the Hub when they initiate the chat, they are automatically associated with the chat and any subsequent ticket that is created. If you display your chat widget publicly (like on your website), the customer will be required to indicate their email address. TeamSupport attempts to match the customers email address with an account record. If a match is found, the chat and any subsequent ticket will be associated with the customer record. In the absence of an exact email match, the system will search for a domain only match. If this is found, a new Contact will be created with the matching Company. If no matches are found, one will be created under _Unknown Company. Customer Access: It is very common for our customers to put a chat button inside of the secured area Customer Hub. However, you may want to make your customer chat available on a more public basis. For example, you may want to put your chat button on your website so that anyone may initiate a chat. To do this, simply copy and paste the provided HTML chat code anywhere you would like a chat button to appear to your customers. You may customize this HTML to have whatever button you would like. Group Specific Chat: A chat icon on your website may be Group specific by adding a parameter to the icon URL. You can learn more about how to make a Chat Group specific in our Chat Setup page. Chat History: You may access chat history through the Reporting Tool at any time by using the primary table “Chat Requests”. You may also build a report on this information to determine how many chats your team has missed by filtering on the field “Was accepted” = False. How will your Customers use Chat? This section discusses how to use the Chat section from within TeamSupport. We have guides that explain how your customers will use Chat from the Customer Hub. You must first setup Customer Chat – click here to learn how. A “chime” will sound indicated a new chat is available. A browser pop up indicating a new chat is available. The first time you receive a browser notification, your browser will prompt you to accept it. Read more here. The chat will become available in the chat window to accept. You may read over the initial chat information to decide if you would like to accept the chat. If you do not wish to accept the chat, you may simply ignore it. Another user may accept the chat, or if no users accept the chat after 120 seconds, the customer will receive a message letting them know that an agent is unavailable and that a ticket will be created for their request. The customer will be associated with the ticket, and the ticket name will be called “Missed Chat”. Leave Chat: Disconnects the chat session with the customer. The customer will receive a message that the user has disconnected from the chat. The customer will not automatically receive any chat history unless a ticket is created for the chat. + Invite Agent: Invite co-workers to a customer chat. This is great for group chats or a warm hand off of the customer between TeamSupport users. To use this, simply click this button while in a chat. Type in a co-worker’s name and invite them in. They will receive a message letting them know of the invite. You can invite as many co-workers as you wish. Once the other TeamSupport user is in the chat with you and the customer, you can simple click the Leave Chat button. This will leave your co-worker and the customer in the chat for completion. Suggested Solutions: This feature is also available on tickets. With Suggested Solutions, TeamSupport will suggest KB articles based on the keywords in the chat conversation. You can also type in the name or number of a KB article. The article text/graphics can be inserted into the chat conversation, or a link can be sent. Attachment: You have the option of attaching a file to send to your customers. For example, you may need to send a PDF or a screenshot of settings that they have a question about. The maximum file attachment size is 25MB per file. Create Ticket: A very powerful feature is to tie chats to tickets and customers. Clicking this button will open the new ticket window and allow you to create a ticket that will capture the entire chat session. It is important to note that you can create a ticket while in an active chat and it will capture all of the chat history that has already happened. If you continue to chat with the customer, the ticket will also update the ongoing conversation. Open Ticket: View the ticket that was created via the chat. Clicking this button will open the ticket in question in a new tab for you to view the details. Add to Ticket: If you already have a ticket created and want to add a chat conversation to an existing ticket, select this button. Doing so will open a window where you can type in a keyword or a ticket number. Any conversation you have in this active chat will be added to the ticket. Chat conversation/history: The main window on this screen is the chat conversation/history. Anything typed by the customer and the agent will be displayed in this window in sequential order. Attachments and other actions (such as audio/video requests) will also be logged. Send: The box at the bottom of the window is where you type in your new message. Clicking the send button will post the comment for your customer to view. This cannot be undone. Go to Audio / Go to Video / Share Screen: Edition: Enterprise Only If chatting is text and pictures is not enough, TeamSupport allows you to switch sharing audio, video, and your screen. Screen Sharing does require a browser plugin for both the client and the agent side for Screen Sharing.